The MUNDI Women's RFID Blocking Wallet Big Fat Wallet With Removable Wristlet: This wallet clutch organizer will keep you organized and looking stylish. This is the same best selling MUNDI Big Fat Wallet that you have enjoyed and loved for so many years but with the new added Feature of RFID Blocking technology. RFID BLOCKING TECHNOLOGY: Each wallet is manufactured with RFID blocking technology. Now you don't need to worry about thief's steeling your credit cards, debit cards or driver's license information. Wireless identity theft, also known as contactless identity theft or RFID identity theft is a growing concern as more cards are enabled with RF-enabled technology. Protect yourself from these thieves with our RFID Blocking Wallet. Our RFID Blocking clutch will secure your Identity and personal information from RFID scanning devices, skimming devices and electric pickpockets. 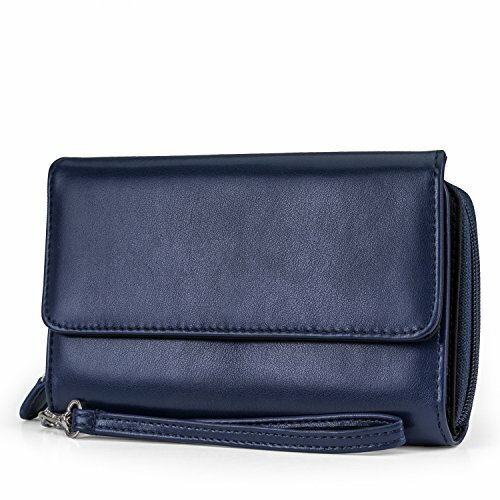 Womens Fashion Wallet Clutch The Big Fat RFID Blocking Womens Wallet by Mundi is just the thing to keep the woman on the go organized, well prepared and stylish all at the same time. Crafted with a durable Pebble pattern print vinyl exterior, this little giant features everything and anything you need to make it through your busy day. RFID WALLET BLOCKING TECHNOLOGY - With built in RFID protection stop identity theft and electronic pick pocketing with and protect your credit cards and other RFID enabled cards from scanners and readers. TWO SEPARATE ZIPPER POCKETS - One large top zip around accordion pocket opens to 2 interior compartments with two large pockets, plus an exterior zipper pocket typically used as a change purse. BEAUTIFULLY DESIGNED FASHION LADIES WALLET - Pebble Pattern finish provides a great feeling and is a stylish looking wallet. Wallet size is 7.5" L x 4.5" W x 1.75" D.
If you have any questions about this product by Mundi, contact us by completing and submitting the form below. If you are looking for a specif part number, please include it with your message.